At Piggs Peake we make Shiraz, but there’s more to it than just that. When you grow grapes, they express where they come from and different sites can make wildly differing wines from the same variety. So, at Piggs Peake, we make Shiraz from 5 different regions around Australia. Some vineyards are at sea level. Some are close to 1000m above sea level! Some are coastal and enjoy a maritime climate while others are inland and struggle with the extremes of temperature found in these regions. What that means is instead of just have one “set” of flavours in our winery for Shiraz, we have a spectrum. If you like perfume or pepper or spice or plum or blackberry then it probably exists in one of our wines and we can blend that character in and out of a Shiraz blend by mixing the regions. Its a great exercise to do. 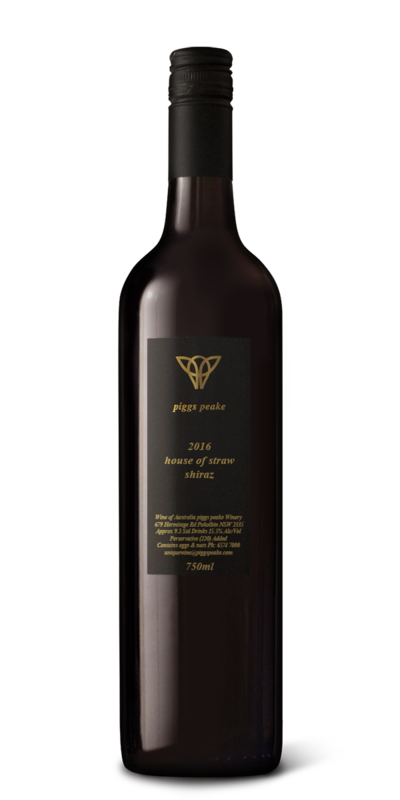 The 2016 House of Straw Shiraz is a blend of cool climate shiraz from Orange with McLaren Vale shiraz. In the winemaking the fruit was crushed, chilled for 5 days, warmed up and fermented for a further 5 prior to being transferred to American oak for further fermentation and then maturation. The resulting wine has elegant, purfumed notes on the nose, while the palate has a fullness and a richness with firm tannins and a dry finish.